Scottish traditionalists would probably be horrified at the idea of sugar free shortbread but it really is delicious. The biscuit loses nothing of its wonderful consistency and has just as much flavour. Try these different recipes for a little variety and to discover which version of the sweet treat you enjoy best with your cup of tea. 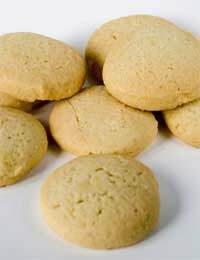 This is a simple, traditional, mouth-watering, plain shortbread. Try making it with granulated sweetener but do remember to read the manufacturer’s instructions carefully. Preheat your oven to 180 deg C/350 deg F/gas mark four. Put your butter into a large bowl and mix with your granulated sweetener. Beat until light and fluffy. Little by little stir in your plain flour until it almost becomes like pastry dough. Dust a surface with a little flour and roll out to about 2cm think. Slice into fingers. Place on a greased baking sheet and put your dough into the fridge for about half an hour. Then bake in the centre of the oven until they begin to go golden brown (usually about 20 minutes). Leave to cool and enjoy. This recipe for shortbread has a little extra “zing” and is a great tea-time treat for kids. Try sugar free jams of different varieties to discover which one you enjoy most. Preheat your oven to 180 deg C/350 deg F/gas mark four. Put your butter into a large bowl and mix with your granulated sweetener. Beat until light and fluffy. Stir in your ground almonds. Sieve your flour, cinnamon and cornflour, and mix slowly in with the other ingredients. Dust a surface with a little flour and roll out to about 1cm think. Cut into circles with a cookie cutter, making sure you have an equal number. Place on a greased baking sheet and put your dough into the fridge for about half an hour. Then bake in the centre of the oven until they begin to go golden brown (usually about 20 minutes). Leave to cool. Then spread one circle with sugar free jam and sandwich it with another. This shortbread recipe calls for the use of honey as a sweetener. It works well with the hazelnuts but do try walnuts or pecans if you prefer. Preheat your oven to 180 deg C/350 deg F/gas mark four. Melt your butter and honey in a small pan over a low heat. Tip into a large bowl and stir in your beaten egg yolks. Add your chopped hazelnuts. Sieve your flour and slowly add. Dust a surface with a little flour and roll out to about 2cm think. Slice into fingers.